Emma will sing Henri Tomasi’s “Procession du Vendredi-Saint,” the final movement of “Fanfares Liturgiques” (1947) during the graduation concert of conductor Guido Marchena. This beautiful piece depicts the passion of Christ. The music has medieval elements: it uses cantus firmus and elements from church modes. It is full of pain and longing, with moments of profound beauty. 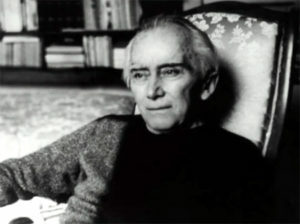 The Dutch pianist and conductor Marcel van Duyvenvoorde celebrates his forty year anniversary as a pianist. He has arranged a series of concerts in aid of MAMAS, a children’s charity helping women and children in South Africa. Emma will open the concert by singing “The Holy City” and “Rule Britannia.” Even if you cannot attend, please take a moment to explore the beautiful work of MAMAS and consider donating. The concert is free: a collection will be taken for MAMAS children’s charity. With the West Yorkshire Police Band in Pontefract last March. 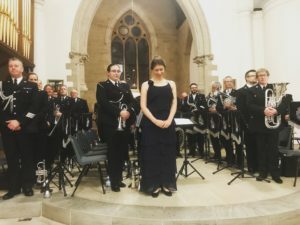 On 18thJune, Emma will be the guest soloist at the Chief Constable of the West Yorkshire Police’s concert in Halifax Minster. The West Yorkshire Police Band will present a lively and varied programme of music. Emma will sing songs of remembrance to commemorate the centenary of the First World War, and some Vera Lynn numbers. Monday, 18th June, 19:30, Halifax Minster, England. The concert is free. Please register here for tickets. On 15thJune, Emma will sing at the spring concert of the ‘s-Gravenzands Male-Voice Choir in the ‘s-Gravenzands, the Netherlands. The choir has been established for ninety-eight years. Emma will be joined by flautist Wenny Roeffer and pianist Marie Searles. The conductor is Freek Elbers. With parachutist John Sleep in 2017. Emma will be traveling to Normandy in early June to sing for various D-Day commemorations and events. Seventy-four years ago, “D-Day” commenced. Six gliders landed during the night of 5thJune, 1944. Their troops captured Pegasus Bridge and Horsa Bridge over the river Orne and the Caen canal between Bénouville and Ranville. The next morning, the biggest amphibious operation in history began. Over four thousand vessels headed to the beaches of Normandy. Some stayed at sea to protect the troops from a naval attack, others brought troops to the beaches. Thanks to the glider troops, it was possible to cross the Orne and the Caen canal and advance in land. With Victor Urch in 2017. The battle in Normandy would ultimately lead to the Allied Forces’ victory on the Western Front. It would also claim the lives of over half a million troops and civilians: some estimates are much higher. Every year, veterans and their carers and descendants visit Normandy to commemorate victims of war. Ceremonies range from small, local events in villages and hamlets to huge ceremonies and parades. Emma’s schedule this year commemorates different aspects of the Battle of Normandy. She will sing at a ceremony in Ranville at the Six Glider Stones, one for each of the gliders which landed during the night of 5thJune. 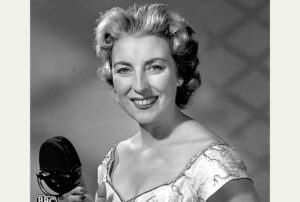 She will also sing during the Midnight Ceremony at Pegasus Bridge arranged by the daughter of Major John Howard, the man in charge of the glider landings. On 6thJune, there will be a special ceremony for the unveiling of a monument for the crew of LCH185, a landing craft which was torpedoed off the coast of Lion sur Mer. Only four of the forty men believed to have drowned have graves.Ninety-four year old Patrick Thomas, almost certainly the only survivor from LCH185, will attend. For more information, please see this short video. The Royal British Legion’s 2017 ceremony in Bayeux Cathedral. There are many ceremonies for the casualties of the sea landings and the fighting that followed. 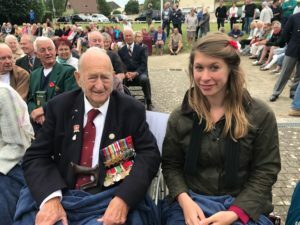 Emma will sing at, amongst others, Vierville sur Mer, Ranville, Gonneville en Auge, Bréville, Grangues, and The Royal British Legion’s ceremonies in Bayeux Cathedral and CWGC Bayeux Cemetery. She will give a concert at Bénouville Castle with the Band of Liberation and the well-known Dutch cabaret singer Lily Kok. This year, Emma has been invited to pay tribute to the US troops in D-Day. 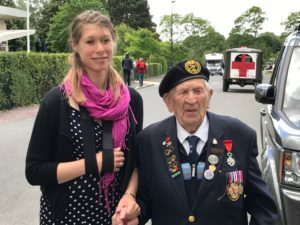 She will sing for the Liberty Group March in Carentan in which serving troops and veterans march to the town square. She will sing at a special ceremony honouring the Native American soldiers buried at the US cemetery in Colleville sur Mer. Veteran Charles Norman Shay of the Penobscot tribe will attend and flowers will be laid on the twenty-nine graves of Native American military personnel who perished during the fighting. For more information about Charles Shay, please follow this link. Emma will also visit the German Battery at Longues sur Mer with a party of British veterans to acknowledge the German casualties. It will be an intense and moving week. 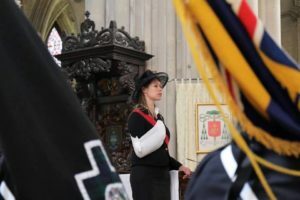 “I vow to thee my country” at The Royal British Legion’s ceremony in Bayeux Cathedral in 2017. 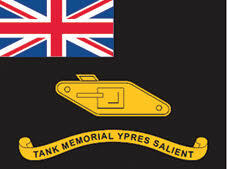 Emma is delighted to announce that she has been made an ambassador for the Tanks Memorial Ypres Salient and awarded life membership to the Friends of the Tanks Memorial. The memorial, located in Poelkappelle, Belgium, commemorates the members of the Tanks Regiments who fought during the First World War in the Battle of Ypres. The construction of the memorial is based on the interior of a tank, with coloured paving stones showing where people sat and the confined space in a First World War tank. Emma will receive her certificate when she visits Ypres this September to sing with the Army Wives Choir. The Dutch celebrate their liberation after the Second World War on 5th May. 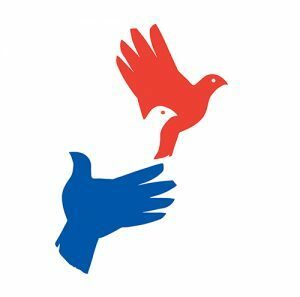 This year, Emma will sing in a short concert in Rijnsburg, together with the Band of Liberation and the Floraband. 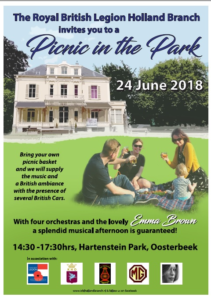 The programme includes songs and marches associated with liberation and the event is organised by the Oranje Vereniging, Rijnsburg. 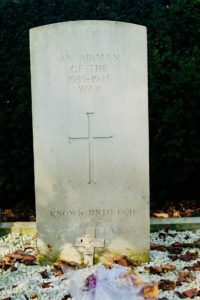 The grave of an unidentified Second World War airman at Heteren, the Netherlands. The Netherlands was liberated from the German occupation in the Second World War on 5th May, 1945, and the 4th May, the last day of occupation, is the Dutch Remembrance Day. Two minutes’ silence is observed at 20:00. This year, Emma will be singing during a ceremony in the CWGC cemetery in Heteren , organised by the Heteren Orange Comité. A group of British veterans who partcipated in the liberation of the Netherlands will be present. Nineteen airmen are buried in the cemetery, two of whom are unidentified. Emma was honoured to lead the singing of “Het Wilhelmus,” the Dutch National Anthem, during the King’s Ball at the Ministry of Defence in The Hague, the Netherlands, on 20th April.